Daily Illuminator: Munchkin Starfinder Kickstarter Is Closing Soon! November 2, 2017: Munchkin Starfinder Kickstarter Is Closing Soon! Our Munchkin Starfinder campaign is ending this afternoon, and we're extremely excited about how it has gone! Not only did the game fund almost immediately, but we've been able to unlock tons of bonus content with the support of our backers. 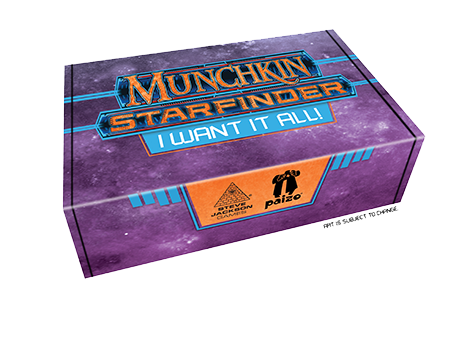 Now our "I Want It All" reward levels get you not only a base game and expansion, but new Munchkin Starfinder content, like Munchkin Starfinder Credsticks, a new Hero Pack, Kill-O-Meter, and a Blank Card Pack, all packed in a box made to hold everything, with its own Munchkin rule! So backers looking for the best value should check out "I Want It All" to get at least $90 of loot for only $60. We've also updated the card backs to match those of Star Munchkin. Card backs don't really affect the ability to mix sets, but for the people who really care, we figured this fits into the same theme, so it made sense. If you're interested in more backstory about the design of the game, check out Andrew Hackard's Designer Notes on Medium! As mentioned, the campaign ends this afternoon, and we've still got stretch goals to unlock! So back now before Munchkin Starfinder heads into orbit!